Heading into next season, expectations will be far greater than at this time last year for the Ottawa Senators. A return to the post season and life beyond the first round is where the bar will be set. But just how high will that measurement of expectation go? After all, it was only last year the Senators were a lottery pick and most experts expected them to finish lower than that for this season! With plenty of talented young prospects on the rise, there will be difficult decisions to be made in Ottawa from the draft, through free agency right up to training camp. 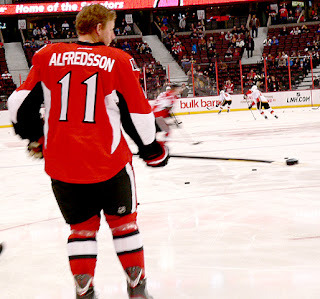 The biggest questions surrounding the Ottawa Senators this summer will be the future of their Captain Daniel Alfredsson, and resigning RFA Erik Karlsson. Alfie has one year remaining on his contract that will pay him $1 million but he is 39 years old and may decide to retire. While he is still playing at a All-Star level, he suffered two concussions this season, and had back surgery the previous off season. It is a real possibility that he chooses his health and family over playing the final year of his contract. Regardless of Alfredsson’s decision, the Senators management will have difficult decisions to make in regards to their forward roster. The Sen’s filled out their roster with players from the Binghamton Senators Calder Cup winning roster from the previous season. Colin Greening, Zack Smith, Eric Condra, and Bobby Butler all played a regular role in the NHL. At times, Greening was looking like a potential Calder Trophy candidate for the rookie of the year playing on a line with Jason Spezza and Milan Michalek. All three were All-Stars, Spezza and Michalek after some ballot box stuffing campaigns in the host city Ottawa, and Greening on the Young-Stars roster. Zack Smith played the third line center position admirably, but Butler and Condra were inconsistent at best. This training camp there will be plenty of competition for those jobs. In the playoffs, Sens fans got a look at two promising players in Mark Stone and Jakub Silfverberg, both of whom acquitted themselves well in their NHL debuts. Mikka Zibanejad is another promising player who will challenge hard for a top six role after nearly earning the spot last year right out of the draft. Potential vacancies at forward may come from Alfredsson (retirement), Jesse Winchester, Zenon Konopka, and Rob Klinkhammer as UFA’s, and Jim O’Brien, and Kaspars Daugavins as RFA’s. Nick Foligno is also a RFA but he will be an easy player to resign. Further clouding the picture is the fact that center Peter Regin who the Sens had hoped would play the second line center position missed most of the season with shoulder injuries again. He has been resigned to a one year deal for only $800K. A steal if healthy! Problem is, Kyle Turris was acquired and filled that role more than adequately. With Zack Smith in the third line role where does Regin fit in? Zenon Konopka played an important role for the Sens winning face-offs and providing toughness, but was a healthy scratch at times and may be lost to free agency. Stephane Da Costa showed he has some excellent skills and offensive vision, but should not be considered for a third or fourth line responsibilities as his defensive abilities are wanting. He will either remain in Binghamton, or be moved. While the Senators may look to upgrade in the top six wing position, the solution may come from within in the likes of Jakub Silfverber, Miika Zibanejad or Mark Stone. If the Sens look outside the organization for help at forward, it will likely be for a depth or leadership player. If Alfredsson does not retire, the Sens could have a real log jam if Regin is healthy and Silfverberg and Zibanejad seem NHL ready as well as potentially Stone. Condra, Butler, and Daugavins could all relegated to the AHL and it would seem Winchester, Konopka, and Klinkhammer will be let go. 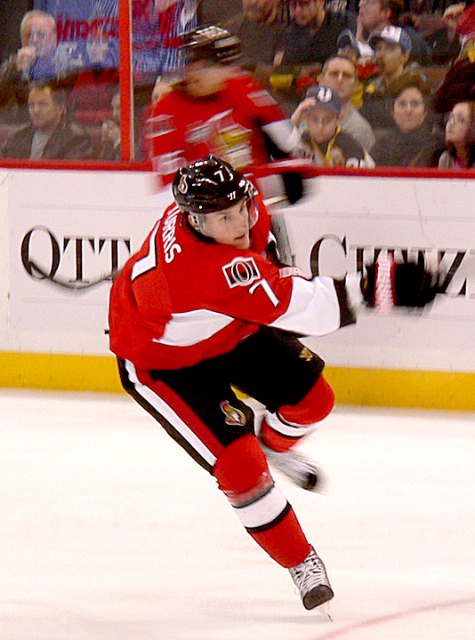 On the blueline, the Sens will have to resign Norris Trophy favorite Erik Karlsson. While that will be a complicated negotiation and expensive, I believe a deal will get done before training camp. Potential departures on defense in clued UFA’s Filip Kuba, Matt Gilroy, and Matt Carkner. That leaves Erik Karlsson, Sergie Gonchar, Chris Phillips, and Jared Cowen under contract. With little options in the prospect pipeline expect the Sens to make an attempt to retain at least one of their UFA’s. No player enjoyed a bigger comeback last season the Kuba who was awful last season and was booed by fans during the team’s home opener. If Kuba is resigned, it will be at less than the $3.7 he earned last year. Matt Carkner is a favorite of the organization, the players, and fans. At $700k he was a bargain, and could be resigned for similar money at a home town discount. Unless either Patrick Wiercioch, or Mark Borowiecki are ready to make the jump ( and I don’t think either is) The Sens will have to add a defender or two via trade, or free agency. Potential off season targets could include Dennis Weidman who would play top pairing with Karlsson or local boys Kurtis Foster or Byan Allen who would come in at a far lower cap hit that Wideman. In goal the Sen’s are very secure with Craig Anderson. Anderson has three years remaining on his deal at just over $3 million and with Ben Bishop well suited as a solid back up there is no need to rush future started Robin Lehner. One potential dilemma the Sens may face is Lehner is a very confident player. Usually an attribute in goalies but Lehner may be confident to the point of cockiness and demand a shot at the NHL, Perhaps he may demand a trade. With two years remaining on his contract, he has little leverage, and may need to bide his time. The Sens will potentially target a defenseman as their forward ranks are swelling and the trade of David Rundblad has left their defensive prospects thin. Potential targets could include Olli Maatta of the London Knights, Matthew Finn of the Guelph Storm. Goaltending is another position the Sens may address at the draft and could target such prospects as Malcolm Subban of the Belleville Bulls or Andrei Vasilevski out of Russia. The Sens likely will not pursue a significant player, rather some depth on the fourth line, and perhaps a top four blueliner. There will be more departures than arrivals via free agency in Ottawa this summer. There is potential for a significant trade this summer perhaps at the draft as the Sens may wish to move up in the draft, target a defenseman or package Lehner for an impact player now, and replace Lehner with Subban. With no CBA, who knows! However, the Sens do have 15 players under contract at a cap hit of about $37 million. They need to resign Karlsson and Foligno but even after that, there is plenty of cap space and limited roster spots to spend it on so the potential for a significant add by either trade, or free agency is there. Owner Eugene Melnyk has demonstrated in the past his willingness to spend up to the cap if he believes the Sens can be a contender. Are the Ottawa Senators true contenders? If they continue to develop as they did last season there is no reason to believe they are not. One thing is for sure; if they are not legitimate Cup contenders as soon as next season, they will be soon! With prospects such as Silfverberg, Zibanejad, Stone, Lehner and more coming to join the likes of Spezza, Karlsson, Turris, and Anderson this young core has loads of skill, potential and promise for Sens fans to look forward to. Posted by pharling at 1:24 p.m.